Chapel Hill, N.C., January 16, 2019: Save the date! Friday, April 5, 2019 will mark the 45th Anniversary Celebration of Child Care Services Association (CCSA) building healthy foundations for young children, ensuring every child’s first 5 years are healthy and happy. 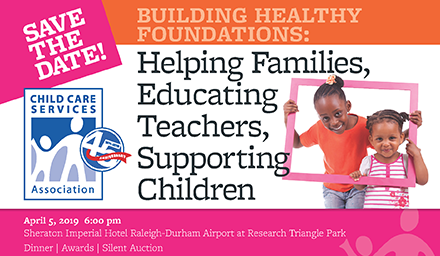 The 45th Anniversary Celebration will take place at the Sheraton Imperial Hotel in Research Triangle Park at 6:00 p.m. Celebrating past accomplishments and embracing new challenges and opportunities, CCSA’s special anniversary event will host a dinner, a silent auction and an award ceremony for the 2019’s James and Carolyn Hunt Early Childhood Award winner. More information to follow. If your company or organization is interested in sponsoring this great event, view our 45th Anniversary Sponsorship Package and please contact communications@childcareservices.org for more information. Founded in 1974, Child Care Services Association’s mission is to ensure affordable, accessible, high-quality child care for all young children and their families. Using a holistic approach, CCSA supports children and families, provides free referral services to families seeking child care, helps child care professionals improve the quality of early education children receive and ensures that all families can afford and access the high-quality early care and education that is so important for a child’s early development. Through its Meal Services Program, CCSA also provides nutritious meals to children at child care centers, where they may eat 50-100 percent of their meals. Our T.E.A.C.H. Early Childhood®, Child Care WAGE$® and Infant-Toddler Educator AWARD$® programs give child care professionals the means to obtain an education and supplement their salary based on that education. CCSA also licenses T.E.A.C.H. and WAGE$ across the U.S. and conducts early childhood systems research and policy development statewide and nationally. For more information, visit www.childcareservices.org.